PSB CS1000 speaker is designed for the great outdoors | What Hi-Fi? The newest addition to PSB's CustomSound Series is this all-weather CS1000 speaker. It's designed for outdoor use on patios and decks, with a durable UV-resistant polypropylene cabinet, aluminium grille and rustproof speaker terminals with a rubber cover. A flexible mounting bracket allows the speaker to be installed in tricky places. The speaker is a two-way design with a 25mm titanium dome tweeter and 16.5cm woofer with a clay/ceramic injection-filled polypropylene cone. There's extensive internal ribbing for extra stiffness, a front-facing port with rubber bung to fine-tune the bass and a special wire management system. PSB says the CS1000 is available now for £299/pair in black or white paintable finishes. 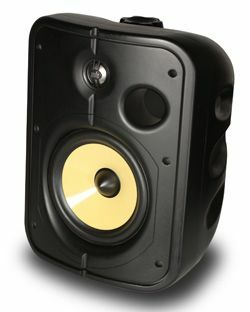 PSB speakers are distributed in the UK by Armour Home.